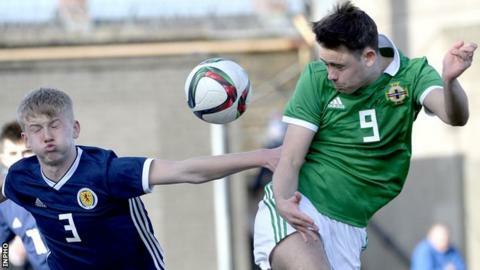 Northern Ireland Under-18 Schools will lift the Centenary Shield if they avoid defeat against the Republic of Ireland in Belfast on Thursday evening. Frankie Wilson's squad have earned 1-0 wins over Scotland and Wales plus a goalless draw against England so far in the competition. The Republic have one point from their opening two games and will earn a share of the trophy with two closing wins. England have completed their programme with seven points from four games. That means they are level at the top with Northern Ireland. Josh Largo-Ellis (St Michael's Enniskillen/Ballinamallard United), Malachy Smith (Breda Academy/Glentoran), Jack Bradley (St Joseph's Boys' Derry-Londonderry/Coleraine) and Trai Hume (NIFL Academy/Linfield), are back in Wilson's squad after missing the England game. Midfielder Sean Og Gallagher (Trinity College Belfast/Glentoran) has retained his place in the squad after receiving his first call-up for the England game. Thursday's match take place at Queen's University Belfast's Dub with an 18:00 BST kick-off. Northern Ireland have won the Centenary Shield outright in 1996, 1998, 1998, 2011 and 2013 and also shared the title in 2005 and 2009. The board of the Football Association of Ireland will step down following a series of financial governance issues, a parliamentary committee meeting has heard. Ireland's Katie Taylor will have the chance to become undisputed lightweight world champion when she fights Delfine Persoon in New York in June.